I love posting short excerpts, as great reminders of ideals that may be applied universally , no matter what belief system we have had our whole life. Thank you Don Miguel Ruiz. Your word is the power to create. Speak with integrity. Say only what you mean. Avoid using the word to speak against yourself or to gossip about others. Use the power of your word in the direction of truth and love. Through your word you manifest everything. By hooking our attention, the word can enter our mind and change a whole belief for better of for worse. The following agreements are born from the first agreement. Nothing others do is because of you. What others say and do is a projection of their own reality, their own dream. When you are immune to the opinions and actions of others, you won’t be the victim of needless suffering. Even when a situation seems so personal, even if others insult you directly, it has nothing to do with you. If you take it personally, then you take that poison and it becomes yours. Feeling offended means you defend your beliefs and create conflict, because you need to be right. Everyone has their beliefs according to their own system, so nothing they think about you is really about you. The problem with assumptions is we believe they are the truth. Find the courage to ask questions and to express what you really want. Communicate with others as clearly as you can to avoid misunderstandings, sadness, and drama. All the sadness and drama you have lived in your life was rooted in making assumptions and then taking things personally. In any kind of relationship we can make the assumption that others know what we think and we don’t have to say what we want….if they don’t do what we assume they should do, we feel hurt and think, “How could they do that?” And the drama begins…so don’t make assumptions. 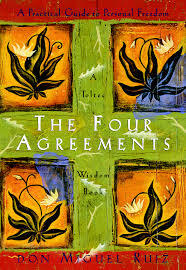 This agreement allows the other three to become deeply ingrained habits. Regardless of the quality, keep doing your best. Your best is going to change from moment to moment; it will be different when you are healthy as opposed to sick. Under any circumstance, simply do your best, and you will avoid self-judgement, self-abuse, and regret. Doing your best you’re going to live your life intensely and taking action because you love it, not because you’re expecting a reward. If you work just for the reward, you actually resist work, because you are suffering to get the reward. When you do your best you accept yourself. And when you take action, just for the sake of doing it, you find joy in every action you do.